The newspaper said both its English and Chinese-language apps were pulled late last month, blocking one of the few remaining channels for readers in China to access its reports. “For some time now the New York Times app has not been permitted to display content to most users in China, and we have been informed that the app is in violation of local regulations,” Apple spokeswoman Carolyn Wu said in a statement to AFP. When the situation changes, she added, Apple will offer the app again for download in China. The latest development marks the latest move by Beijing to suppress the newspaper’s publications in China, after the government blocked its website following a 2012 Times report saying that former premier Wen Jiabao’s family controlled assets worth $2.7 billion. 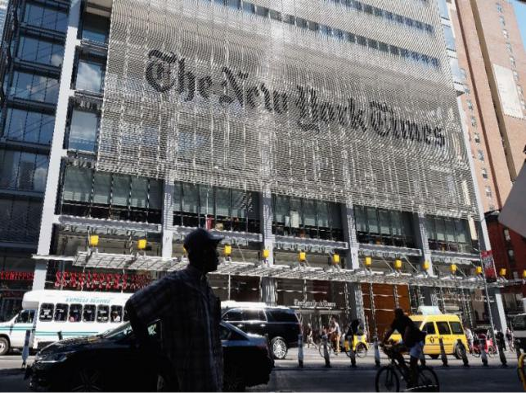 Incoming correspondents for The New York Times were not given Chinese residence visas in apparent retaliation. China’s Communist Party oversees a vast censorship apparatus designed to censor online content they deem politically sensitive, while blocking some Western websites and the services of Internet giants including Facebook, Twitter and Google. A Times spokeswoman said the company asked Apple to reconsider its decision, it added. China has seen a sprawling crackdown on dissent under president Xi Jinping, restricting citizens’ speech online and jailing hundreds of lawyers who had taken on civil rights cases considered sensitive by the ruling party. The world’s number two economy is a crucial market for Apple products, and a key part of its supply chain. But sales of the iPhone have slumped lately, with revenues in the key “Greater China” market down 30 per cent in the fourth quarter to $8.8 billion, according to Apple’s annual report.